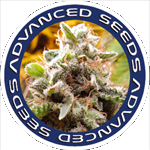 Advanced Seeds - Top 69 Auto. Free US delivery. Auto Top 69 is aptly named “69” because it tends to sprout and finish in just about that time! This strain’s genetics are a cross between Low Ryder and Indica. Note well that Top 69 does not do very well in cold climates so only cultivate during the summer warm season if this applies. And like most auto-flowering strains, this one is ideal for both indoor and outdoor cultivation.